The Ward Family: Little Fishies! This past Saturday I met up with my friend Ann and her little boy Tate (who is just 1 week younger than Brody) at the pool. As I've stated previously, Brody just loves the water, he squeals, splashes and kicks his legs. 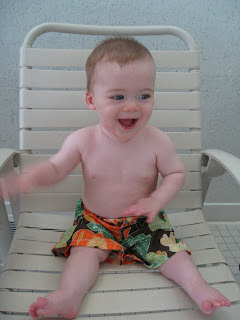 We are thinking about getting him into swimming lessons this fall given he loves the water so much! This was Tate's first time swimming but he too loved the water! 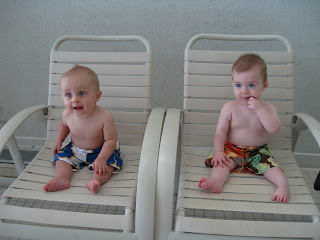 We are thinking about making swimming at regular thing with Brody and Tate this fall and winter! Something to do on those long, cold, dark winter days that are right around the corner!! 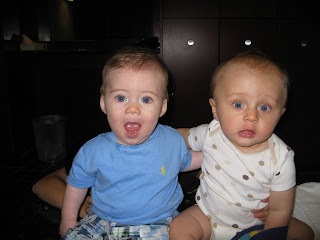 Buddies, they put their arms around each other...we didn't do that!! 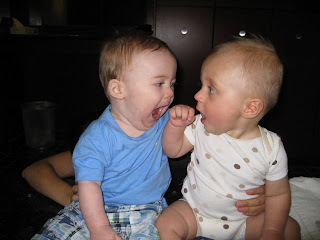 Brody was quiet talkative this day...as you can see by this photo! I believe behind the scenes Ann was dancing and jumping to get the boys attention!! Ohh what we'll do to get a good photo! He was all excited about getting in the water!